In late ’89, Victoria Clare from Island Publishing in Los Angeles brought forth the idea of signing Bootsy Collins’ latest copyrights, and as I recall, was curious if the label side might be interested as well. I was up for hearing it either way, so she pouched me a cassette. He’d basically recorded what turned into the JUNGLE BASS EP and circulated the tracks as a demo. At the time it all seemed perfectly out of step/in step with the moment, meaning Bootsy’s Rubber Band had been dormant long enough to shake off the stink of declining sales in their heyday, replacing it all with comeback potential. 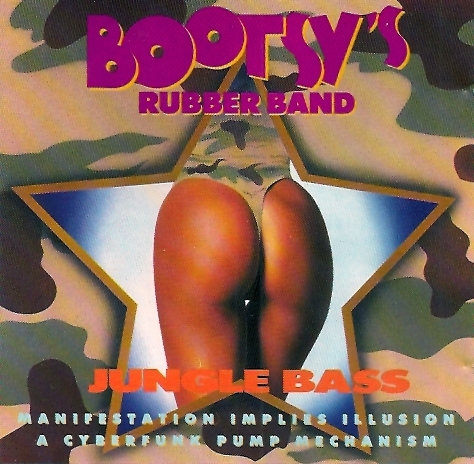 Whether by design or not, Bootsy was keen to revive the band’s name and begin trading once again as Bootsy’s Rubber Band. Without much deliberation, everyone at Island was on board and off we went. Bootsy was one awesome sweetheart to work with. In no time, he assembled Fred Wesley, Maceo Parker and the core team. Mudbone Cooper was on front-ground vocals and Bootsy himself, suddenly self proclaimed as The Megabasstron Magus Lord Of The Riff for the studio logs, performed space bass, guitar, drums, black noise, unsamples and vocals. Someone named Boot-tron got the robot vocal credit for fun as well. I do wish I’d saved some of his voicemails to the home phone. They usually started with “Hey Kev, it’s Bootsy baby”. This guy is a higher form of life, and he’s calling me at home. Sick. God bless English record labels. They’ve persevered with thick, deep grooved 7″ pressings in non-flimsy picture sleeves to this day. 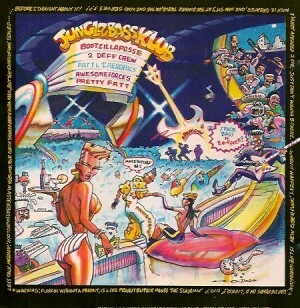 It was a close call, but Island’s UK office hesitantly agreed to a ‘Jungle Bass’ 7″, all 13:10 minutes of it. How can anyone not love this record? I’ve never found a person who didn’t thankfully. The press and UK fans certainly went for it big time, and presto – a few nights at Hammersmith Odeon went on sale. Bootsy is publicly known to avoid all forms of air travel, having been on a Concord flight back in the day that plunged to 10,000 feet and miraculously landed safely. This encounter was relayed to me by the man himself. So, when a few weeks after that run of London shows, I looked up to find Bootsy standing in my office doorway, I shouldn’t have been surprised. Inquiring what’s up, why was he in town, I discover he’s just back from England. Okay, did you spend some time there after the show? I’m thinking, I know you don’t fly, but you gotta fly to and from England. Does overseas really count if you’re a non-flyer? Indeed it does. Personally, I fear the ocean. But the ocean at night, that’s even scarier. Therefore, you’ll always find me trying to take a daytime flight and get over there or back before dark. Never ever did Boosty not have a hilariously logical comment about every last thing. He just pukes ‘em up. Which brings me to the single’s B side ‘Disciples Of Funk’. Lyrically full of Bootsy-isms. The guy’s well just never runs dry. If the “You’re the best boyfrien…” intro isn’t enough, a smattering of other Bootsy one liners from the song are proof: “Bebop and boogie woogie baby”, “Don’t funk with my funk”, “It’s time to put some bass in that bottom baby”. Luckily, nowadays, Bootsy is never out of style. I’ve called on him several times through the years since JUNGLE BASS, for co-writes, features, sessions, production. Within days, he’s back with more than needed. Great work ethic. Great soul. One of a kind.